Slot fans have software developer Playtech to thank for an extensive online slot collection that spans an extensive range of premium-quality titles which stand out with unique features, user-friendly interface, rich graphics and engaging sounds that enable players to enjoy their gaming sessions to the fullest. Yet, visual appeal should not be the only criterion to look for when one chooses an online slot to play. Not all Playtech slots are created equal, at least as far as payout percentages are concerned. Some of the titles are less volatile and boast higher payout percentages, meaning that players would hit winning combinations more frequently, but the monetary prizes they collect would be smaller. Others have higher volatility and pay out less frequently, but the profits are more substantial. Which type of slot you choose depends solely on the size of your bankroll and whether or not you prefer action-packed games. Nevertheless, it is recommended to aim for Playtech slots that offer a payout percentage of at least 95.00%. For those of you, who are unfamiliar with how Return to Player Percentages (RTP) work, we would like to explain they reflect what percentage of the money players have wagered on a given online slot will be paid back to them over time. Thus, if the payout percentage of a Playtech slot is 97.40%, for example, this indicates that for every £100 wagered, players can expect to be paid back about £97.40, while the other £2.60 remain for the online casino because they represent its built-in advantage. Do have in mind, however, that while accurate, the theoretical percentages of Playtech slots reflect what the payouts will be over extensive periods of time that involve thousands of reel spins. It would be unrealistic to expect to generate a £97.40 in profit per every £100 you wager on any given slot in one afternoon. This is because the percentage numbers are skewed each time lucky players collect a more substantial win. If any given player succeeds in generating £1,000 with a bankroll of £100 by triggering a bonus game or a round of free spins, for example, they would upset the averages for fellow slot fans, who will have to lose more than 2.60% of the time so that the payout percentage can even out to 97.40%. Despite that, it would be best to opt for Playtech slots that offer higher payout percentages as this would boost your overall chances of turning greater profits. Before we proceed with the highest paying Playtech slots you should look for, we would like to say a few words about the leading software developer. Ever since its inception in 1999, Playtech has been enjoying an excellent reputation in the industry for being a key provider of quality online gambling solutions. The company has partnered with some of the most reputable online casino operators in the industry, providing them with bespoke slot titles, poker, table, and bingo games, live dealer and sports betting offerings. Playtech has its headquarters on the Isle of Man and employs over 5,000 individuals in 13 countries. The casino games, developed by Playtech, are highly regarded for their vivid and crisp visuals, amazing animations and hassle-free gameplay, not to mention many of them have been fully optimised for mobile play and are compatible with smartphones and tablets, running on Android and iOS. 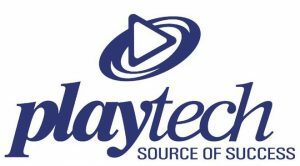 The company’s gaming library continues to expand at a rapid pace – as many as 50 new titles are added to Playtech’s portfolio each year. Slot fans will not be disappointed either as Playtech provides them with an opportunity to choose from various old-school, classic three-reel slots or play a number of advanced video slots that impress with superb 3D graphics and lucrative features like bonus games, free spins, multipliers, wild and scatter symbols. Since Playtech has launched an extensive range of slots over the years, players would hardly be able to check each single title on their own. To assist slot fans in making an informed decision as to which slots to play, we have limited our list to five popular slot titles, courtesy of Playtech, that boast the highest payout percentages. Check them out to see which one suits you the most. If classic slots are what you are after, we strongly recommend you to give Playtech’s Goblin’s Cave slot a try. This is a traditional three-reel slot with 3 paylines, but it allows players to benefit from a few interesting features, nevertheless. The game features an old goblin with a droopy face, worn-out slippers and reading glasses who operates the reels manually. 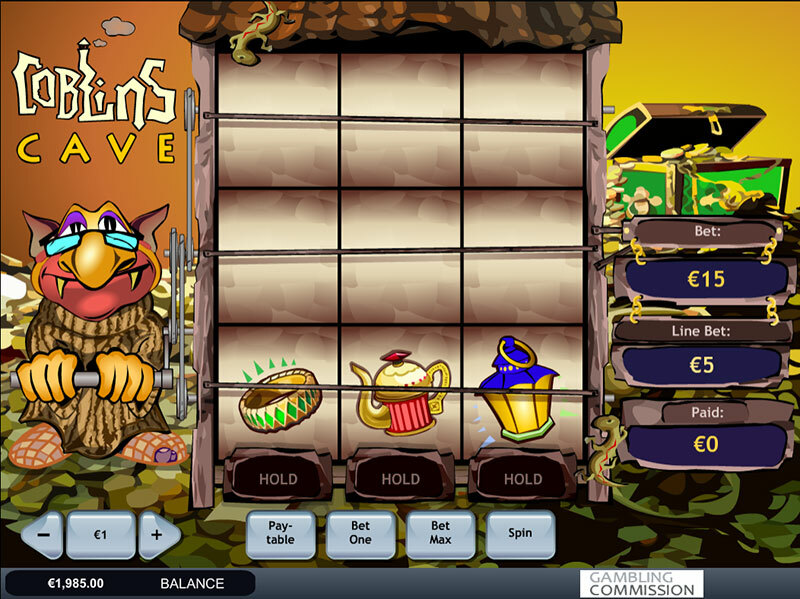 Unlike most traditional 3-reel slots, Goblin’s Cave surprises players with a few lucrative twists. First of all, the game features wild symbols which help players complete their winning combinations. Interestingly enough, there is a “pick me” mini game which is triggered whenever players succeed in landing three lantern bonus symbols on a payline. Provided that the initial spin has not resulted in a win, players can resort to the Hold functionality which allows them to keep any of the symbols on the lowest payline across the three reels. This might improve their chances of forming a winning combination on the subsequent spin. Goblin’s Cave ranks as the highest paying Playtech slot as it has a payout percentage of 99.32%. Playtech’s Ugga Bugga is yet another traditional three-reel slot but unlike Goblin’s Cave, it has 10 paylines that are linked to the independently spinning reels. The game has quite the winning potential with a payout percentage of 99.07%. Ugga Bugga takes players to an exotic island as it employs masks, drums, and coconuts as symbols. Similarly to the Goblin’s Cave slot, this title, too, features the useful Hold functionality. The golden mask symbol functions as a scatter. Players who land three of these scatter symbols can collect winnings that amount to up to 1,000x their initial stake. Then again, three black mask symbols on the reels guarantee a prize of up to 1,000 coins. Since the idol symbol plays the role of a wild, it can help players form more winning combinations. Coin values in the game range between £0.01 and £5.00. The maximum amount you can bet per spin is set at £250.00. 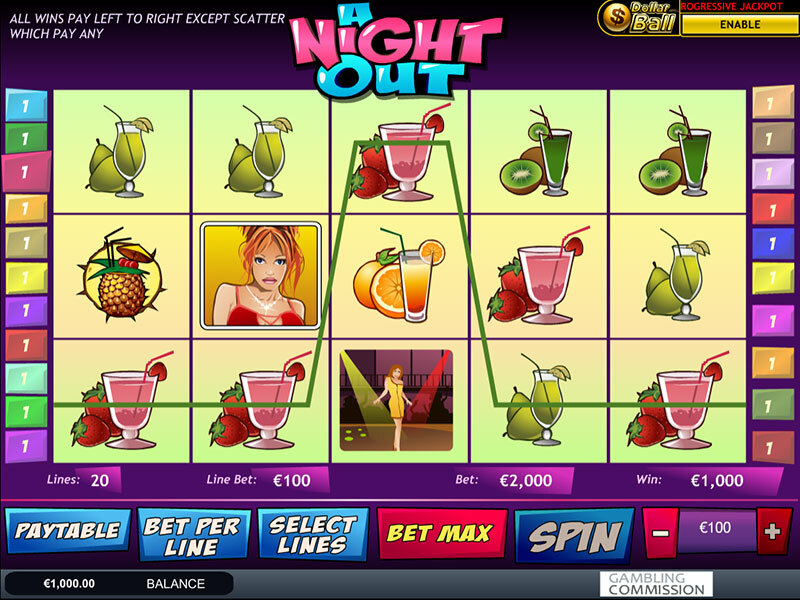 A Night Out is a five-reel slot with 20 paylines that pleases the eye with colourful and vivid graphics. Apart from its payout percentage of 97.06%, A Night Out attracts players with the progressive jackpot that is attached to the game. Coin values range between £0.01 and £1.00 while the maximum bet amount is set at £200.00. Some players might consider the graphics a bit cartoon-ish as the game was released a while go. Nevertheless, this slot deserves to be given a chance since it offers a number of useful features. For instance, the beer mug functions as a wild symbol and can substitute for any symbol on the reels with the exception of the scatters and the bonus symbol. Speaking of scatters, they can multiply players’ winnings up to 50x their initial bet. While free spins are unavailable in this slot, there is a bonus game that gets activated whenever players succeed in landing five bartender symbols on the first and the fifth reel. Another thing that is great about A Night Out is that the paylines are not fixed. Thus, players are given the opportunity to choose which lines to activate and bet on. Players can also choose whether to activate the Double Ball jackpot by clicking the Enable button, located under the jackpot sign, at the start of the game. 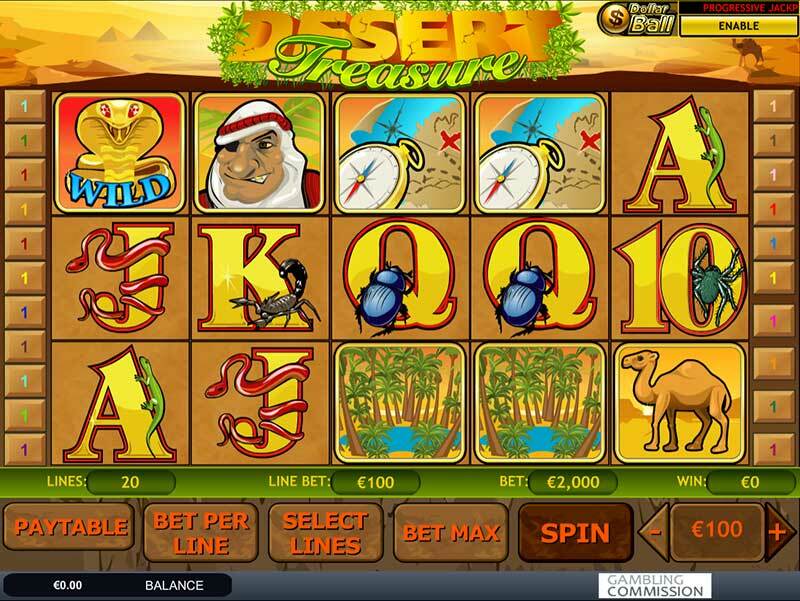 Boasting an Egyptian theme, Desert Treasure is a five-reel slot that allows bets to be placed on up to 20 paylines. The paylines are not fixed so you get to choose which ones to deactivate and which to bet on. Some of the symbols players are likely to encounter in this game include an Arab, an oasis, a camel and a compass. Different high cards are used for the lowest-paying symbols. Apart from that, Desert Island enables players to form more winning combinations on the active paylines with the help of the golden cobra symbol which functions as a wild. Collect five of those and you will be rewarded with 10,000 coins. A beautiful maiden with jet black hair assumes the role of a scatter symbol. Players who land three or more scatters on their active paylines are awarded 10 free spins. 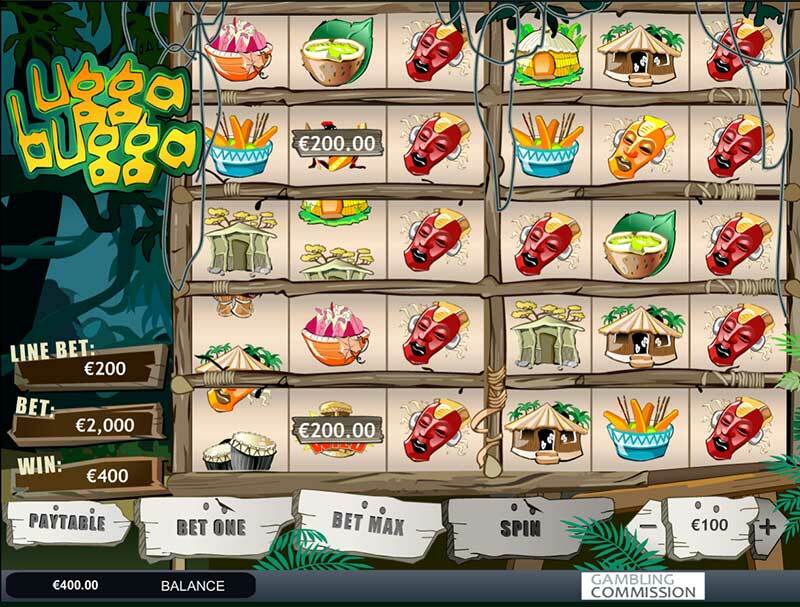 The “pick’ me” bonus game enables players to maximise their profits. With an RTP of 97.05%, Desert Treasure definitely deserves to be given a chance. Now, if you are interested in playing a more graphically-advanced Playtech slot that offers a reasonable payout percentage, Iron Man 2 is the title you most definitely need to pick. The game is part of Playtech’s popular Marvel series and is based on the eponymous blockbuster. Please note Playtech has developed two variants of its Iron Man 2 slot. One of those has only 25 paylines, while the other offers 50 paylines. We suggest you opt for the 25-payline version because it comes with a higher RTP of 95.98% as opposed to the payout percentage of the 50-line variant which stands only at 92.31%. You will benefit from a nice range of advantageous features, including expanding wilds, scatters, free spins and the so-called “mixed pay” functionality. 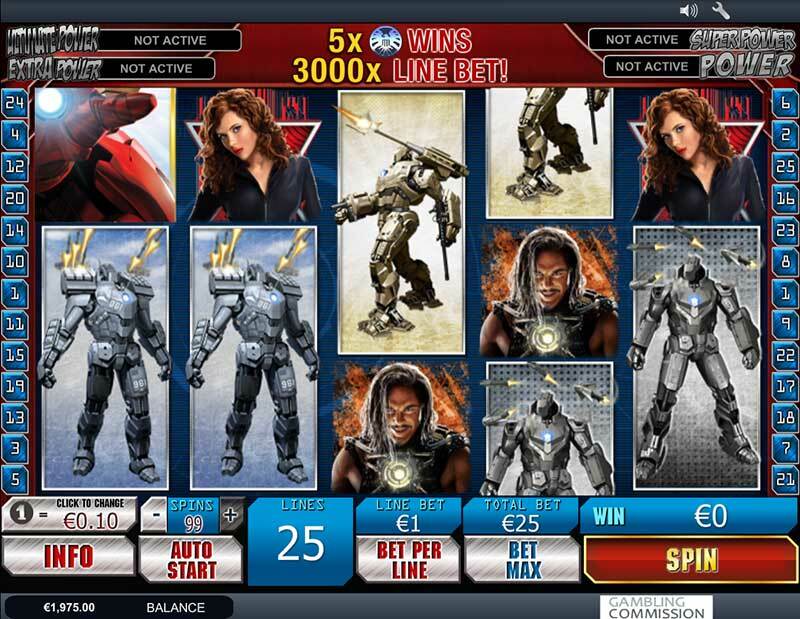 The game may boast a lower RTP in comparison with the other four slots on our list, but this is entirely justified as Iron Man 2 is among the slots that are linked to Playtech’s Marvel Jackpot Network. Players who unlock the Iron Man 2 bonus game are guaranteed one of four progressive prizes – the Power, Extra Power, Super Power and Ultimate Power jackpots.